Thanks to Steven Tatum at Virginia Tech for educating me about African masks, an art form I’ve long been fascinated by. The variety of forms and uses boggles my Western European accustomed mind! Customs involving the wearing of masks proliferate throughout West and Central Africa. The forms the masks take and the reasons for their use are varied, but a few generalizations can be made for nearly all mask making traditions. The most fundamental property of a mask is that the person who wears it loses his or her own identity and becomes possessed by the spirit of the mask. Another common property of masks is that they are part of an ensemble of materials that make up an entire costume. The carved portion that covers the face, which we normally think of as a mask, is only a portion of the costume. A mask does not have its full power until all of the other components are attached. Masks are nearly always worn by men. The exception is a mask worn by members of the women's Sande society in several ethnic groups in the West African countries of Sierra Leone and Liberia. 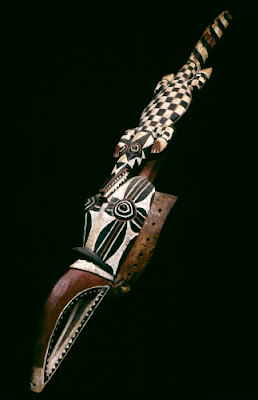 The hornbill and crocodile motif is fairly common in Burkina Faso among the Nuna culture. The Nuna migrated from Ghana in the 1400s. The Nuna historically are farmers who grow a variety of crops, including yams, corn, rice, and beans. Women grow the cash crops that included tobacco and sesame. Fishing and hunting are practiced during the dry season. Animal-shaped masks are the primary sculpted forms of peoples in this part of Africa. Nuna societies are comprised mainly of farmers without social or political stratification. Belief in a supreme creator is central to Nuna customs. Homes contain family shrines that reflect their dependence on farming and often contain animal masks or sculpture. Animal-shaped masks are the primary sculptural form among the Nuna The hornbill mask is worn on the face with the wearer looking out through the two round eyeholes. The hornbill symbolizes knowledge and wisdom. The crocodile is related to a water spirit, guaranteeing fertility and prosperity. 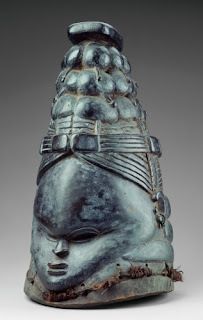 The beauty of this mask, aside from the sophisticated carving, is the contrasting patterns. The palette of red, white, and black is typical of Nuna masks. Studio activity: Animal mask. Look at pictures of animals for ideas and decide what animal is most desirable. Draw a big shape of the animal’s face, bigger than your head, on heavy construction paper, and cut it out. Cut eye holes to fit your head and add straps. Paint or color the surface of the animal’s head and add other paper shapes such as whiskers and hair in different colored construction paper.